We are only going to consider three quarks. Combinations of quarks form baryons and mesons. Baryons – always contain 3 quarks. 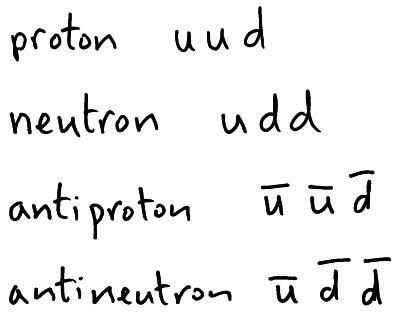 For example a proton contains the quarks, up up down. 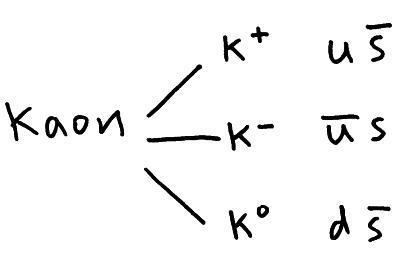 Whereas an antiproton contains the quarks, antiup antiup antidown. Mesons – always contain 2 quarks ( a quark and an antiquark). 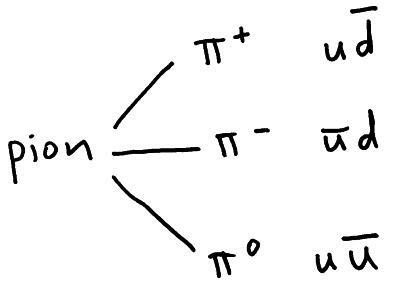 For example the p+meson contains the quarks, up and antidown. During particle interactions the following are conserved (the number before the interaction must equal the number after the interaction).